Campervan Hire Australia - Book direct to get low prices guaranteed! Travelwheels campervan hire Australia vans have everything you need for your trip is already included in the price! Therefore with us you don’t pay extra for chairs, tables and the rest of the equipment! Call our campervan hire Australia team on 0412766616 for a quote. We speak English, Deutsch and Français, and remember you can email us in these languages at [email protected]. 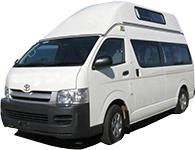 Travelwheels offers great deals on cheap camper hire Australia packages. 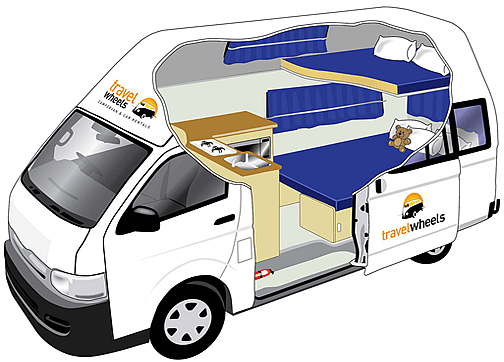 The Travelwheels Campervan Hire Australia hitop campers come with a combined living and dining area. 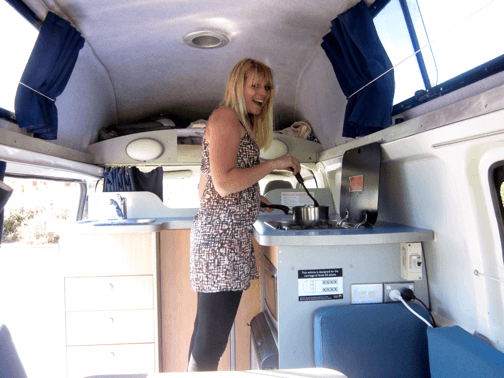 For example, our 3 person campervan has an upgraded kitchen and lounge area. This is a great space to cook and entertain in. Here is a link to our 3 person campervan for hire page for you to find out more info about this van. These campervan hire Australia Hitop campers have clean lines. They do not have massive marketing slogans on the side of the vans because we don’t like travelling billboards! Therefore you will not feel like a tourist driving a mobile brightly coloured advert! Furthermore, it has a well designed kitchen to prepare food and cook for you. The kitchen area has a 2 burner gas stove that is is both easy to use and more importantly especially easy to clean! By the way the cooker connects to a refillable gas bottle. Therefore it cheap to refill instead of using those expensive small gas cartridges! All our campervan hire Australia hitop campervans all have 55L fridge included in the kitchen. Our larger automatic campervan rental vans come with a bigger 80L fridge which is handy! The fridge is simple to use and for example the 2 way battery system allows the fridge to recharge whilst you are driving. Therefore when you stop at a campground at night you can simply plug in the power lead and chill. As a result of using the powercord the fridge, microwave and power sockets will work from the mains electric. Here are links to the two most popular supermarkets in Australia to compare food prices, Woolworths and Coles Supermarkets. All Travelwheels campervan hire vans have the following equipment included in the price when you hire from us. For example all campervans include Knives, Forks, Spoons, Plates/Bowls, Pans, and cooking utensils are included. Remember you do not have to pay extra for the equipment with Travelwheels campervan hire Australia vehicles. Plenty of room to chill out in the daytime! The travelwheels campervan hire Australia van all have nice comfy benches during the daytime to relax. 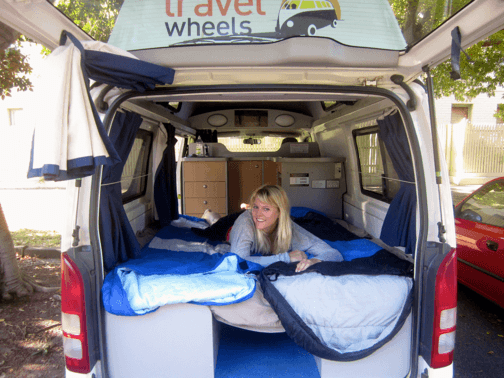 The Travelwheels Campervan Hire Australia hightop campervans all have two beds in each vehicle. For example they are both very easy to convert in to a bed at night time. Afterwards they quickly fold away again in the morning back to a table and two comfy benches. Here is a link to our page about our spacious automatic campervans for hire. These are great because of the extra space and easy to drive. Rear lounge area converts in to a double bed (1.85m x 1.55m). There is also a single bed in the HiTop roof 1.60m x 1.4m (max weight for roof bed depends on which model you hire). Campervan Hire Australia campers with big bed! All our Campervan Hire vehicles have curtains on all the windows for privacy. The sliding windows on our vans have fly screens to let in air (and keep the flies out!) as Australia is a very hot country! The great thing about Travelwheels Campervan Hire Australia is that our staff have travelled extensively around Australia. We can help you plan your trip to Australia and call us on 0412766616 for a chat. We have plenty of free advice and guides on places to go and things to do. Here is a useful link to 2015 Trip Advisor page listing top things to do in Australia. Camper Hire Australia – deutsch or Francais! We can speak plenty of European languages as most of our customer come from Europe. Our staff can speak a range of languages from Deutsch, Français, and even Chinese! You can visit the deutsch camper mieten Australien website or our location van Australie Français website here. Check out some of our customer reviews from happy campers! Need help planning your campervan hire road trip to Australia? 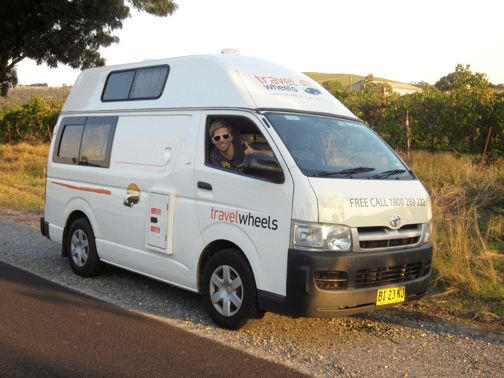 Travelwheels campervan hire Australia staff really know how to plan a campervan road trip in Australia! For example if you need help about how to plan your holiday, so then we can help. For instance not sure what the weather is like in Cairns and when is the best time to visit with a campervan? How about where can I camp for free along the East Coast of Australia? As an example to help you plan your campervan road trip in Australia, here are some useful links. Cheapest petrol prices in Australia – read our guide to cheap petrol down under! 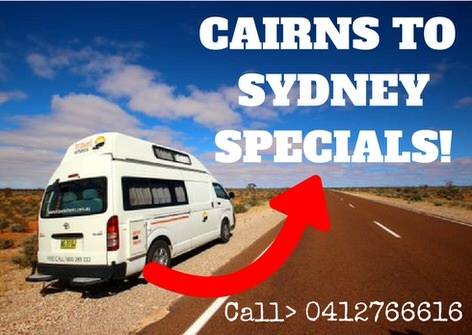 Enter your dates below for our best deals on Campervan Hire Australia Specials. You can always call our team on 0412766616 for more details on our offers available. For example our team are specialists in finding low cost campervan hire deals. 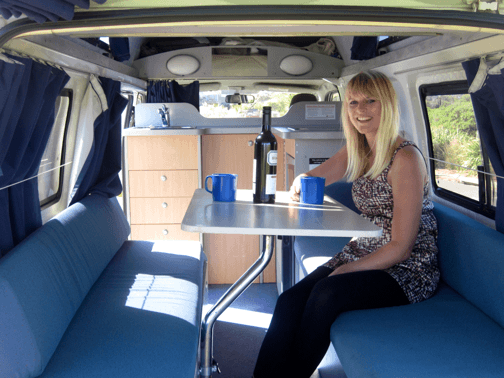 Travelwheels offers a campervan hire price match guarantee! Find it cheaper and we will therefore do our very best to beat our competitor rates for you! Our online price checker will give you our lowest rates on camper hire in Australia.